Skip to Gibson County Chiropractic's Contact Info? When a painful muscle strain sidelined my work-out routine I thought I would be better in a few days, but the pain just kept getting worse. After a week, the intense pain that began under my shoulder blade began to radiate toward the front of my body across my ribcage. I was hesitant to see a medical doctor for something as simple as a strained muscle, but after a few days I couldn’t even find a comfortable position to go to sleep and one wrong move left me frozen in pain. My doctor is so booked with scheduled appointments that injuries are referred to a walk-in clinic or ER. With no walk-in clinic available, the emergency room was my only option. I was so embarrassed to go to the ER for a pulled muscle, but I was exhausted, in pain, and unable to function. I had to go through the admitting process, wait in the waiting room and change into a hospital gown. It was excruciating to lift my arm to remove the clothing from my upper body. I spent 15 minutes describing my symptoms to a nurse, then I waited for the doctor to arrive at which time I had to explain it all again. The doctor was very kind and reassured me that I just had a bad muscle strain that would improve with cortisone, muscle relaxers and pain medication. I gladly took the prescriptions and headed for the pharmacy where I waited, in pain, for them to be filled. The whole experience took nearly 5 hours, but I was finally hopeful that relief was in sight. Over the next few days, the medication was successful in dulling the pain, but I was taking it around the clock and running out fast with very little improvement in the underlying problem. I was falling asleep readily, but it was a medicated, restless sleep that did little to relieve my fatigue. When I woke up, I just needed more medication. Nothing was changing! Finally, in desperation, I called Gibson County Chiropractic. Dr. Phillips scheduled me to come in the very next day. As a Registered Nurse, I have been working in the field of conventional medicine for almost 30 years. I have to admit to being skeptical about chiropractic treatment, but conventional medicine was failing me and I was desperate, so I was willing to give it a shot. Dr. Phillips greeted me in his office lobby and took me to an exam room where I explained my history and symptoms directly to him instead of going through a third party. I could tell by the questions he was asking me that within minutes he knew exactly what was wrong with me. Still, he completed a very thorough exam before telling me he thought the problem was a subluxated rib. He explained that this could be a very painful condition and while adjustment might be a little uncomfortable, it should provide significant relief. As we headed for the treatment room, I was still skeptical and now worried about how I would tolerate the treatment. It was so painful just to walk around and move that the thought of someone pushing, pulling or abruptly moving my body in any manner was pretty frightening. I even remember thinking that something like this could actually make me feel worse! In the treatment room, Dr. Phillips applied warmth and electrical stimulation that was actually as soothing as a nice massage. 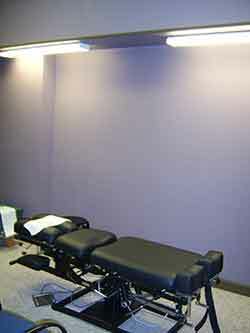 Once my muscles were relaxed, he performed a practically pain-free adjustment followed by a cool compress. Much to my surprise, I felt relief within minutes. I was so surprised and grateful. I was in his office less than an hour and by the end of the day, about 75% of my pain was gone. I felt like a new person. Two additional treatments brought complete relief within a couple of days. Dr. Phillips is a wonderful, caring chiropractor who diagnosed, treated, and significantly improved my pain in minutes. The only regret I have is that I didn’t see him sooner. Knowing that I suffered needlessly for two weeks is a huge incentive to call Dr. Phillips first — and next time I will! As a first time visitor to chiropractic care, we were a little apprehensive about what to expect, but Dr. Phillips and his staff couldn’t have been better for our daughter. The atmosphere was extremely comfortable, the attention to our daughter’s needs was first rate, and the overall service that we received was much better than we ever expected. THANK YOU Dr. Phillips! I was involved in a car accident in September 2008. I went to Gibson County Chiropractic for treatment of the whiplash I incurred due to the accident. I was extremely pleased with the treatment that I received. Dr. Phillips was trustworthy, friendly, sincere and addressed my healthcare needs. I appreciated his help in all areas of my treatment. I would highly recommend Dr. Phillips and will seek his help in the future. Trent was referred to me by a friend and I needed help in a hurry. The pain was interrupting my job and my sleep. He did a thorough exam and treated me. Within days I was able to get back with my busy life. Within two weeks I couldn’t hardly tell that I had a bulging disc. Want to share your story? You may email it to us. Click here to receive our monthly newsletter and information about upcoming events.